Quick charge power bank are essential, especially for travelers and backpackers who require long-lasting battery power to capture their adventures. Usually, travelers and backpackers do not have much time to wait for devices especially mobile phones to charge. Thus, if there is a kind of charger which can charge fast, this would be a great help especially for recording their adventures. Recording travel videos by travelers and backpackers is a must to capture each moment and adventure perfectly. The recorded videos are not only for personal and family collections, but can even be uploaded to Youtube for public viewing. Apart from that, the recordings can generate income to travelers and backpackers through certain ways, especially with the display of ads in the videos on Youtube. The more the video is watched, the more it can generate advertising revenue to the travelers and backpackers. In fact, owners whose videos get millions of views on YouTube have received thousands of dollars every month.Thus, travelers and backpackers are able to earn revenue from their video footage’s. That’s why many travelers and backpackers do not miss the chance to shoot videos for their adventures and upload the videos to Youtube. However, there are certain obstacles faced by travelers and backpackers in recording videos. The obstacle which a traveler normally encounters is limited battery power which quickly drains or does not last long for outdoor activities. Imagine how much of a bummer to the travelers and backpackers when their phone or camera suddenly run out of battery power while recording a great adventure. Disappointed, furious, and dismayed may be part of what a traveler and backpacker would feel. They are certainly dissatisfied with the ability of power bank charging devices in the market so far. Actually, the need for a fast charging charger is one of the issues which are often addressed in almost all travelers and backpackers’ blogs all over the world. In this case, of course 10000mah power bank which is capable of supporting a variety of uses with super fast charging power, is very necessary. Hence, UMORIE® Malaysia’s Quick Charge World Wide Travel Charger, using the world’s leading phone processor; Qualcomm Quick Charge 3.0, can effectively and efficiently perform tasks and functions. This portable charger is capable of supporting multiple uses and good news, the charging power is super fast. This Qualcomm processor is widely used in adaptors, power banks, and USB cables for fast charging support. What is more interesting is that regardless of the small size of the power banks, they have physical features which are particularly suitable for outdoor activities. In term of size, it meets the needs of traveler and backpackers who need their equipments to be as “travel size” as possible. This is quite true because UMORIE® Malaysia’s Quick Charge World Wide Travel Charger has very simple design and is easy to carry anywhere. Besides, it can be used for a variety of electronic gadgets which travelers and backpackers usually carry along for their adventures. Of course for travelers and backpackers, such a quick charge power bank is indispensable. It is extremely helpful at unexpected times, especially when it comes to recording adventures. Again, if you are a traveller or backpacker looking for battery power charge for your adventures, some of UMORIE® Malaysia’s Quick Charge Power Bank features are worth considering. Its physical features are durable and very helpful when the plan is also very suitable for the uses of travellers and backpackers. It is also dust and water resistant. Therefore, investing in buying UMORIE® Malaysia’s Quick Quick Charge 3.0 Power Bank is definitely worthwhile and a smart move for all travelers and backpackers. 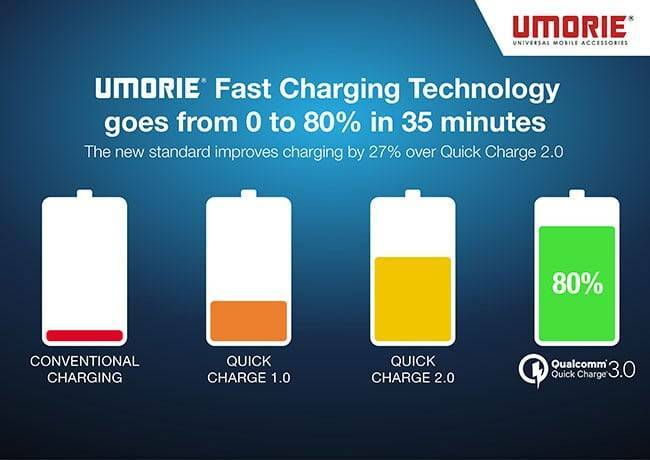 Meanwhile, in addition to producing a power bank for phones, UMORIE® Malaysia has also produced a car jumper starter. This device helps travelers who travel via motor vehicles for their adventures. Car breakdowns can occur at any time, especially if a traveler uses a rented car. The condition of the rented car is not known for sure. The vehicle may be “off” or break down at any time. This is very difficult and disturbing to any traveler. In this situation, this is when UMORIE® Malaysia’s car jumper, power bank and travel adapter is a handy tools you can bring along while traveling. For more information about Quick Charge Power Bank, please check out on our store.